HMS Argyll of the British Royal Navy is currently visiting the Alexandria Naval Base to facilitate discussions between senior Egyptian and UK Naval Officers about future cooperation, including training exercises and maritime security in the Mediterranean and the Red Sea. On 9 July, HMS Argyll hosted a reception on board for guests including Vice Admiral Ahmed Khaled Hassan Saeed, Commander of the Egyptian Navy, Wendy Freeman, British Consul in Alexandria, Ingy Mourad Fahim MP, and Mai Mahmoud MP. HMS Argyll has had an illustrious career in the British Navy, from countering the smuggling of narcotics in the Caribbean to counter piracy operations in the Middle East. It has a crew of over 200, including two female officers, and is due to join coalition assets conducting Maritime Security Operations in the Gulf. Egypt and the UK are facing shared challenges in maritime security and counterterrorism. The UK will not leave Egypt to stand alone in facing security challenges in the region. The visit of HMS Argyll is the latest in a series of high-profile steps forward in our defence cooperation, to strengthen the bonds between our two navies. 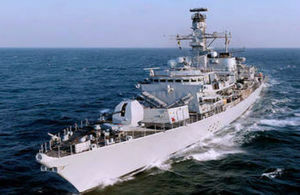 The visit of HMS ARGYLL is an example of the deepening military relationship between Egypt and the United Kingdom. We face common threats together and our increased maritime relationship is just one example of such cooperation.